Students pursuing their Master of Laws (LLM) in Taxation or Master of Taxation (MT) degrees have already made a smart career choice. These advanced tax degrees can make your résumé stand out to a prospective employer and help you gain invaluable knowledge and experience in your chosen area of specialization. In today’s highly competitive job market, it also helps to be proactive in cultivating professional relationships with colleagues and potential clients to make a name for yourself. Here are four networking tips to help you make headway, whether you are a current, former or potential LLM or MT candidate. If you are new to networking, start small. Your online graduate tax program is filled with like-minded people who are on a career path similar to your own. Some may already have experience in various areas of tax law or a related field. Get to know your peers, and make an effort stay in touch after you graduate. Those early relationships may prove invaluable throughout your career. Professors and guest lecturers are also potential networking partners. Take the time to learn about their backgrounds, ask questions and find out how you can stay in touch. Be sure also to take full advantage of your school’s alumni network. Get involved in alumni organizations in your area and try to attend any local meet-ups. LinkedIn offers the opportunity to network anytime from the comfort of your home or local coffee shop. 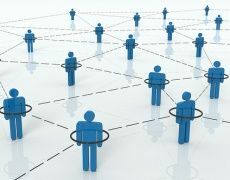 Start by connecting with people you already know, such as current and former co-workers and classmates. Once you’ve built your network, use keyword searches related to tax law to explore companies and people with whom you would like to connect. If someone in your existing LinkedIn network has a relationship with someone you would like to meet, you can request an introduction. You can also find peers, colleagues and clients on social media networks like Facebook and Twitter. No matter which platform you use, make sure your profile is current, complete and professional. Be proactive in joining groups related to your area of expertise, and participate by asking questions and contributing to the discussion in a positive and valuable way. Organizations like the National Association of Tax Professionals, the National Society of Tax Professionals and the Institute for Professionals in Taxation can be useful resources for finding information and building relationships with colleagues in your field. They may also host conferences and other events that offer the opportunity to meet and network with fellow members. Sometimes the most powerful networking skill is simply asking for what you want. It may seem forward asking someone to refer you to a company for which you would like to work or a potential new client, but once you get comfortable doing so, you may find it’s one of the most effective ways to meet someone. Referrals can come from colleagues, clients and even friends and family outside the field of tax law, so be creative when looking for ways to make contact with a person or organization. Networking can be a challenge, even for students and professionals who excel in their fields. Use these tips to build confidence in your networking skills, and begin establishing relationships that will serve you throughout your career in tax law.